New year, new opportunities to advance your project management career. There’s always room to better oneself, make connections and get a picture of the industry: all good reasons to take time to visit one of the many project management conferences held in 2019. Whether you’re looking to enhance your education, keep your certification updated, learn new methodologies, play with new project management tools or socialize with your peers, project management conferences offer a wide variety of experiences for the novice and journeyman alike. Project management training is the glue that holds your career together. 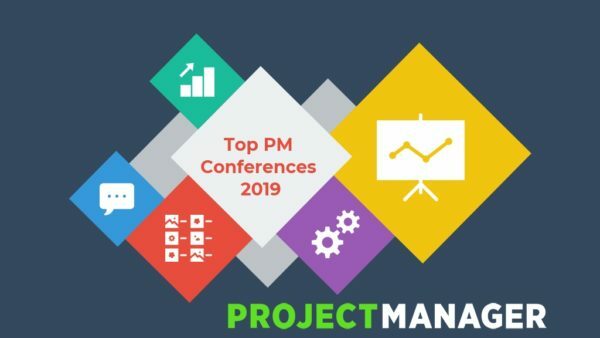 So, as you start to plan your calendar for the year, we’ve offered a rundown of the best project management conferences in 2019. See you there. The Royal Institution of Chartered Surveyors (RICS), which accredits professionals in land, property and construction industries, offers this full-day conference designed for valuers. This event features topics relevant to professional development, with industry speakers. The Association of Change Management Professions (ACMP) holds its annual conference, which is one of the largest in the industry and offers a chance to meet with colleagues from around the world. It supports professional growth, with many sessions to focus on your personal interests. The Scrum Alliance offers its annual networking and learning opportunity, with new solutions and tools to help deepen your knowledge of Agile. It features over 1,000 Scrum and Agile practitioners coming together to discuss new ideas, create community collaboration and make connections. Part of a series of national conferences for project managers and business analysts accredited by both PMI and IIBA, where participants can earn PDUs/CDUs. There are industry experts and education sessions, workshops and keynotes. Check the website for more conferences. Organized by the Research Institute of the Project Management of the Faculty of Business, Management and Economics, University of Latvia, in cooperation with the Professional Association of Project Managers, the aim of this conference is on scientific research. There is an opening plenary session, parallel sessions, and all abstracts have been double-blind reviewed. The conference is in English. This must-attend event for the Agile community speaks to new Agile tools and techniques, patterns and practices emerging in the field. Participants learn how to support and evolve their Agile engineering practices as they relate to advances discussed. The three-day conference explores topics such as DevOps approaches, UX design and cloud computing. “Delivering Value in a Transforming World” is the theme of this year’s APM Project Management Conference. The one-day event has a program of influential speakers who will discuss how project management can better deliver value with innovative methods, tools and techniques. Hosted by the accrediting agency PMI, the EMEA Congress gathers project, program and portfolio managers from around the globe. They are there to discuss best practices, identify new trends and reinforce core industry skills. Agile & Beyond is a grassroots and volunteer-run event that serves to educate on Agile principles and practices. It also covers topics related to Agile. There are approximately 100 sessions packed into the two-day conference, suitable for those new to Agile and the Agile experts. The 13th annual conference caters to newcomers and certified practitioners alike. Topics range the gamut, from Agile to strategic project management, including soft skills and behavioral competency. The two-day conference is also available online, and PDUs are available for attending. An international forum for the discussion and debate of all project management and engineering companies and professionals, the conference is geared towards experts, researchers and trainers who are focused on educating future professionals in the field. However, all interested persons are encouraged to attend. This PMI-hosted event focuses on the evolving role of project management, this conference is open to project, program and portfolio professionals and will discuss new ideas and approaches, while giving participants the opportunity to make new relationships and strengthen existing ones. This PMO conference is created by Wellingtone, a PPM consultancy that works with clients across the UK. The organization is both a Microsoft Gold Partner with PPM Specialization and an APM accredited training provider. This one-day conference is for practitioners at all levels and brings together leading project management experts from across the industry. The Digital PM Summit is a three-day conference of presentations, breakout sessions and talks. It welcomes all methodologies and approaches, from Agile to waterfall and hybrid, offering new perspectives in a social networking-friendly environment. The PMO Symposium gives participants access to executive-level networking, workshops and discussions. Learn actionable insights for organizational executives, PMO leaders and senior decision-makers. The details for the 2018 event have yet to be posted. Whatever conference you decide to attend next year, and whatever the lessons learned, you’ll always know that you can face the future of project management with confidence when you are equipped with the right tools for the job. ProjectManager.com is a cloud-based software that features everything you need to manage your project, regardless of the methodology applied. Try it free with this 30-day trial.